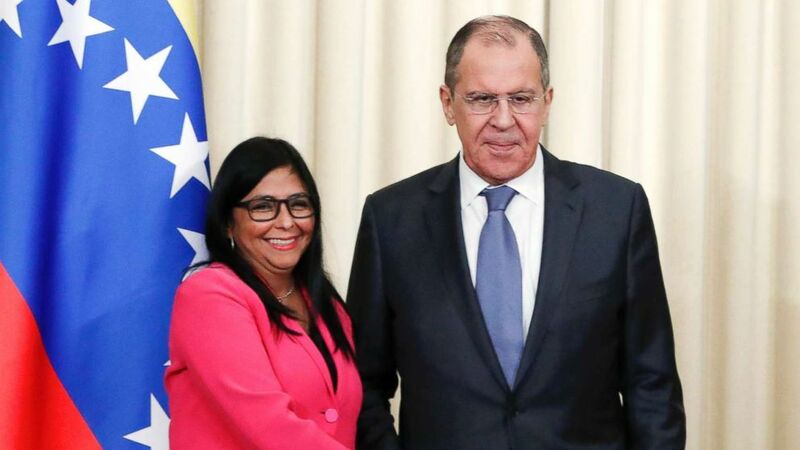 Moscow -- Venezuela's Vice President Delcy Rodriguez on Friday met with Russia's foreign minister Sergey Lavrov in Moscow for talks -- a sign of Russia's sustained support for Venezuela's embattled president as the United States continues to try to pressure him to resign. Russia has emerged as Nicolas Maduro's most important public backer in the Cold War-style crisis that has seen the U.S. and 50 other countries recognize his opponent, Juan Guiado, as Venezuela's interim president; Moscow and its traditional allies have backed Maduro. Russia has denounced the U.S. efforts to force Maduro out as illegal regime change and has warned Washington against military action, which President Donald Trump in recent days has refused to rule out. Ahead of the Moscow talks, the head of Venezuela's foreign ministry, Jorge Arreaza, said Rodriguez was traveling to discuss how to coordinate efforts to prevent "war against Venezuela." Following the meeting on Friday, Lavrov said that he could not rule out an American military intervention and accused the U.S. of preparing to supply arms to Venezuela's neighbors. "Knowing the present approaches of the administration, anything is possible," Lavrov told a press conference with Rodriguez. Lavrov accused the U.S. of buying small arms, mortars and MANPAD missiles from an eastern European country with the goal of supplying Venezuela's neighboring countries. He did not say why, but added that Russia was also supplying "massive deliveries" of wheat to Venezuela, which is facing serious food shortages. Trump said this week that "all options are on the table" for resolving the crisis, but Pentagon officials have said that no specific planning for military action are being drawn up. Russia has become a key ally of Maduro in recent years, propping up Venezuela's broken economy through loans, often in return for oil shipments, and supplying billions of dollars in military equipment. Since the present crisis began, there have been unverified reports of unusual Russian assistance to Maduro, including that Russian mercenaries have been deployed to bolster Maduro's personal security as well as accusations that Russia has secretly flown out tonnes of Venezuelan gold. Russia's investment in Venezuela has been estimated to amount to at least $17 billion, which some analysts predict Moscow stands to lose if Maduro falls. In a sign of Russia's deepening importance for Maduro, Rodriguez on Friday announced that Maduro had ordered the headquarters of the country's state oil company, PdVSA, be moved from Lisbon to Moscow. The U.S. last month sanctioned PdVSA to cut off oil revenues to Maduro's government, viewed as one of the most serious steps taken by the Trump administration to pressure the Venezuelan president. The move, analysts said, was likely intended to shield PdVSA from the effect of sanctions, which have prompted companies to stop trading with it. Russia's own state energy giant, Rosneft, owns a 49.9 percent stake in PdVSA's U.S.-based subsidiary, Citgo Petroleum, as collateral for a $1.5 billion loan made in 2016. Rodriguez and Lavrov said Russia and Venezuela had agreed to sign new cooperation agreements when an inter-governmental commission from the two countries meet in April. Venezuela's deputy foreign minister, Ivan Gil, and the country's industry minister, Tareck El Aissami, were in Moscow last week for talks with senior officials, Reuters reported. The crisis in Venezuela has increasingly focused around humanitarian aid, as the U.S. and Guiado have sought to force deliveries into the country, where millions have fled because of critical shortages of food and medicine. Last weekend, at least two people were killed and hundreds were injured in fighting at Venezuela's border with Colombia as opposition demonstrators sought to push convoys carrying American aid across it and were met violence from pro-Maduro border troops. The contest over aid has become a proxy for the political battle, with Maduro seeing the issue as an attempt to undermine his control. On Thursday night, Russia and China vetoed a U.S. resolution at the United Nations Security Council that called for new elections and the free access of humanitarian aid into Venezuela. The U.S. vetoed a Russian counter-resolution that condemned outside intervention in the crisis and required aid deliveries be authorized by Maduro's government. Russia's ambassador to the UN, Vassily Nebenzya, said the American resolution was simply a "pretext" for achieving regime change. "This would be the first time in history where the Security Council would dismiss and appoint the president of a sovereign country," Nebenzya told the council. The U.S. special envoy for Venezuela, Elliott Abrams, told reporters ahead of the vote that regardless of the result it "showed democracies around the world and especially in Latin America are mobilizing" behind Guaido. "The time for a peaceful transition to democracy is now," Abrams said. The deadlock at the UN underscored how the international response to the crisis is hardening along traditional Cold War fault-lines. China, which also vetoed the measure, has an even greater economic stake in Venezuela than Russia. China has invested at least $50 billion in Venezuela through oil-for-loan agreements over the past decade, according to Reuters.